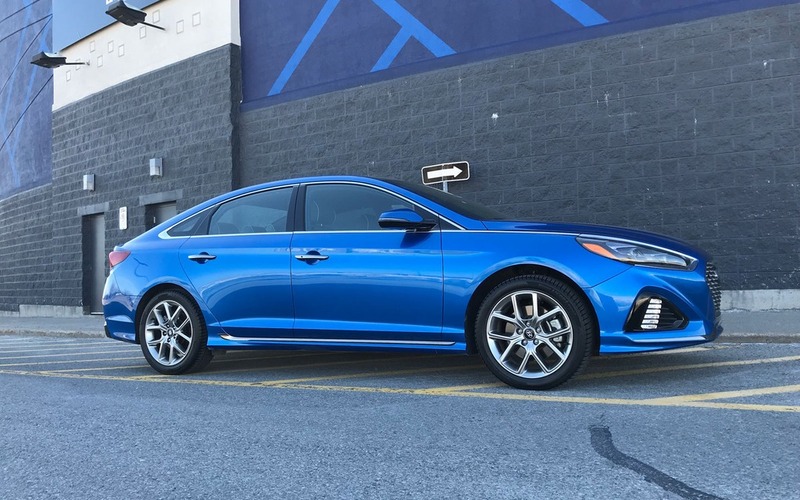 The 2018 Hyundai Sonata received a mild update this year, improving on an already solid offering from the Korean manufacturer. Gone are the days when Korean cars were considered inferior to the Japanese and this vehicle should be on anyone’s test-drive list. Hyundai still hasn’t managed to pass the midsize sedan competition in Canadian sales, coming in fifth behind the Toyota Camry, Honda Accord, Ford Fusion and Chevy Malibu, with Hyundai moving 7827 units. Running down the list after the Sonata are the Nissan Altima, Kia Optima, Volkswagen Passat, Mazda6 and Subaru Legacy. It’s a dwindling segment with many people migrating towards crossovers and SUVs, so it’s no surprise that few models posted gains over the previous year (namely the Passat and the Mazda6). Looks-wise, Hyundai has updated the exterior to be a little classier, a little less curvy than the previous iteration. Our tester came clad in electric blue paint, which kind of feels more appropriate for a sports car, but to each their own. The interior of the Sonata is well done, functional and comfortable. The buttons and dials feel firm to the touch and everything is within reach except for the volume button. You have volume controls on the steering wheel, but it would be nice to have a dial moved closer. The leather seating surfaces were excellent and hold your body in place firmly yet comfortably. The leather-wrapped, flat-bottom steering wheel was just as good, making for an all-around pleasant cockpit feel. The spacious interior will be able to fit your family or co-workers, and the trunk’s 462-litre capacity will fit plenty of suitcases for jaunts to the airport. The infotainment screen is positioned between two vents and is a tad smaller than it could otherwise be. The integrated design is a bit old-school and most of the competition is moving toward protruding units which sit on the dash itself. Other than that, there were no issues I could find with the system and it was easy to use with many neat features such as the ability to record satellite radio channels even when you’re not listening to them. If you just missed the end of a song or sports update, the system will allow you to rewind and hear it in full. Apple CarPlay and Android Auto integration are standard. The Sonata comes with either a 2.4-litre, four-cylinder engine making 185 horsepower and 178 lb.-ft. of torque, or a turbocharged, 2.0-litre engine making 245 horsepower and 260 lb.-ft. torque. Hybrid and plug-in hybrid versions are also available. 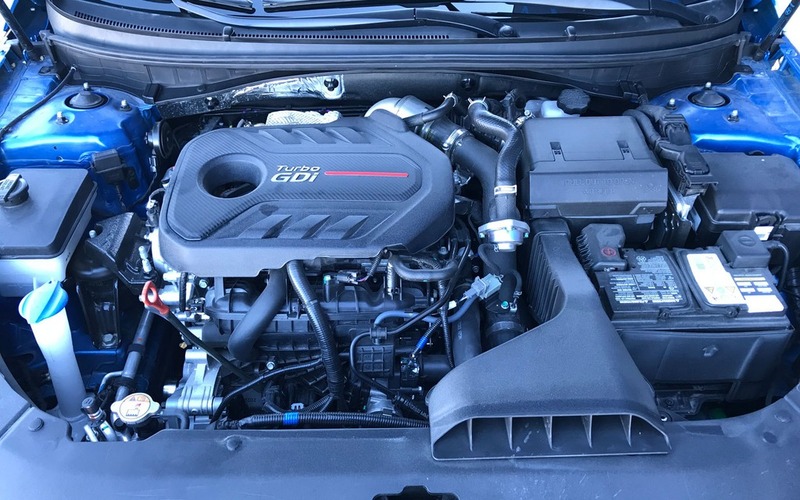 Our test vehicle was equipped with the 2.0-litre engine. The Sonata was very peppy and satisfied my leadfoot enough. The eight-speed transmission was smooth except for some slight hesitations, should you step on the pedal a little too quickly. It was similarly adept in terms of road feel with a solid, firm ride and the ability to take corners and quick manoeuvres with ease. Fuel economy was on par with the ratings and I registered 10.2 L/100km with a lot of city driving. The Eco, Normal and Sport driving modes can be interesting to play with, obviously Sport being the most fun. Sport modifies steering calibration and throttle sensitivity for those spirited country back road jaunts, while Eco relaxes the car’s throttle input to maximise fuel efficiency. Even in Normal mode, the Sonata performs admirably. Every 2018 Sonata comes with a five-year subscription to Hyundai’s roadside assistance system called BlueLink. You’ve surely heard of GM’s OnStar, and this is similar. In addition to emergency assistance, you can operate various functions of your vehicle on your smartphone such as the climate controls, door locks and the remote starter. 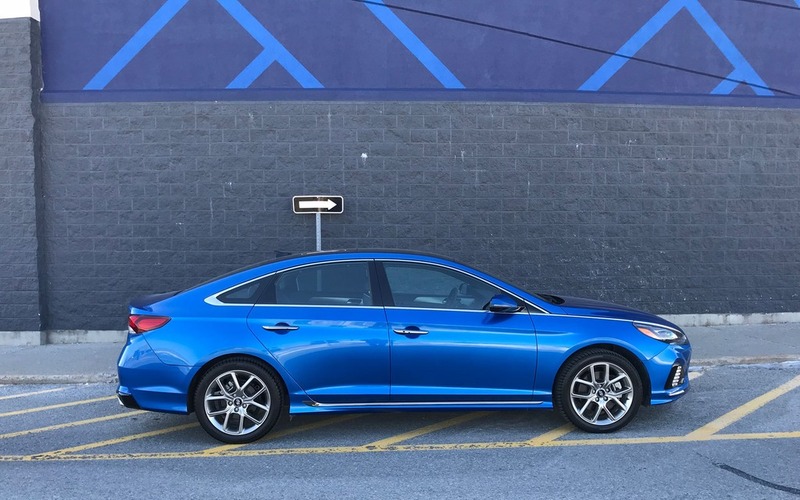 The question I kept asking myself was “is the Sonata and exciting vehicle to own?” I can’t say that excitement is the feeling that comes to mind, but in the Sonata’s defense, very few midsize sedans could be classified as such. People don’t get excited to buy an Accord or a Camry, but they serve a general purpose as people movers without the bulk and fuel consumption of SUVs. The Sonata fulfills this role well. Pricing is competitive and the base Sonata with the 2.4-litre engine starts at $24,799 before freight and delivery charges. The 2.0T will run you $36,999 and the hybrid variants range from $30,000 to $44,000. 8/10	Very good for a vehicle of this size. 8/10	The 2.0T engine delivers strong performance. 8/10	A capable alternative to the competition.